For Some Value of "Magic": Wrong About MySpace ... and What Else? Wrong About MySpace ... and What Else? Now the the Murdoch empire's six-year trip to the shitter has seen MySpace thrown out of the group for chump change (and there's a stockholder lawsuit waiting to be tried, since arguably it has sold a 95% stake in a still very large chunk of Internet traffic) I thought we might look back and see what it was that Murdoch thought made MySpace a good buy in the first place. If ever a statement were designed to bring hubris down on the head of an errant corporation, "our company has begun to ... surpass the Internet elite" would be it. It's the corporate equivalent of John Lennon saying the Beatles are bigger than Jesus. Clearly the gods decided there and then that, no matter how wisely it was managed, no matter how exceptional the staff assigned, no matter how crystal clear Fox Interactive Media's Internet vision was, this company was doomed to failure. Profits, improved infrastructure, broadened offerings. These are all things a growing business likes to be able to report. With increased revenues and profits on the horizon it would be, in Private Eye magazine's timeless phrase, "treble brandies all round" in the boardroom. In 2008 News Corporation, tiresomely, and in a magnificent display of lack of understanding the Internet medium, turned to Flash for the annual report. The Flash tool was so opaque the only option was to download the PDF again. Only now I had to search it for myself. Arguably, News Corporation ought to know what "publishing" is. This is not it. 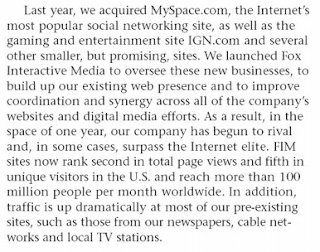 Mention of MySpace is sprinkled throughout the report, with nary a sign of the coming storm on the horizon. A photo site had been acquired to compliment MySpace, and MySpace had been in partnership with this, that or the other enterprise to produce some Internet media coup or other. All very boring and normal, really. No clue is given as to the identity of these "people" from "within the industry", but since these purport to be the words of Chairman Murdoch, we may safely assume he counts himself among their number. Charging bravely onwards we see MySpace now relegated in reporting to an "Other" section created almost specially for Fox Interactive Media (the only other company reported under that heading is an Eastern European hoarding space sales organization). And what do we read? 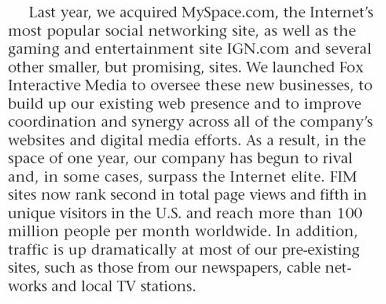 MySpace is just one of a number of domains in a tiny little part of a huge empire. These people have bigger fish to fry, right? Since I haven't yet seen a 2010 annual report I will decline to speculate about the level of enthusiasm, but I think even Bertie Wooster would, in MySpace's place, be feeling a certain coldness and considering a return to London's safer climes. And now, today, comes the announcement that what remains of MySpace is to be unceremoniously sold like, well, like a business that's had all the value pissed out of it by people who don't understand "new media" and think that old media muscle is all that's really needed to weather this technology storm. The interesting question for me is, if Murdoch could be so wrong about MySpace a scant six years ago, what other losing technology bets has he made? MySpace demonstrates very clearly that value can disappear from a networked enterprise in a surprisingly short time. News Corporation could be in serious trouble if it fails to adapt to the Internet age as Microsoft so nearly did.